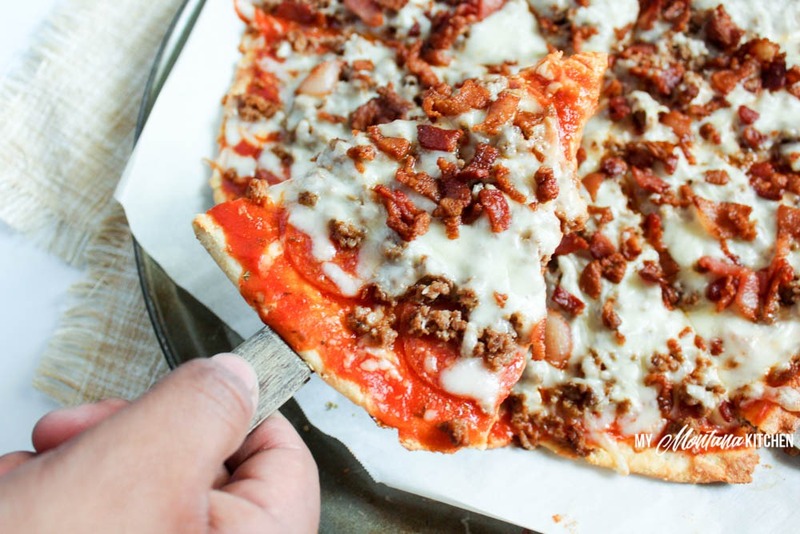 A low carb pizza topped with three different meats, and with a crust sturdy enough that you can pick it up and eat it with your hands! 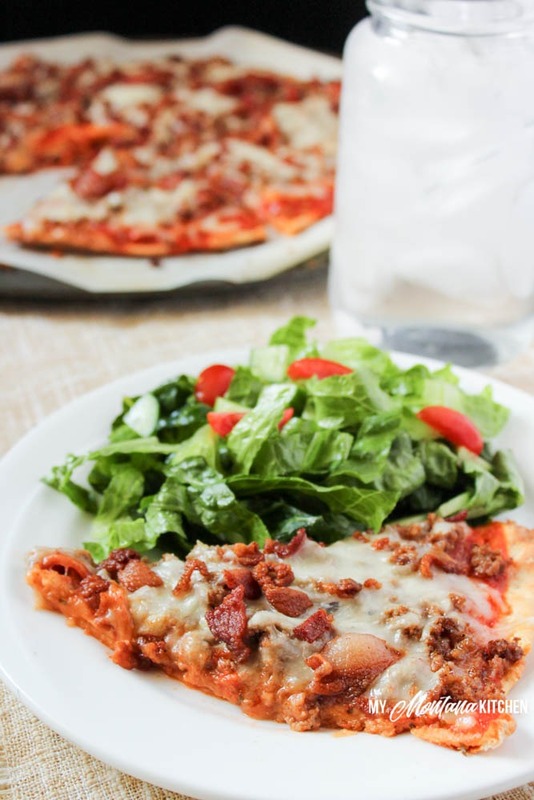 This recipe is low carb, sugar free, and a Trim Healthy Mama “S” fuel. So, . . . this is what I ate for supper tonight. And it was SO GOOD! Honestly . . . it was one of the best low carb pizzas I have ever made! My husband was the inspiration for this recipe. At lunch time he mentioned that he wanted a loaded meat pizza, so I determined to make one for supper. I precooked my bacon in a skillet on the stovetop, but you could just as easily use real bacon crumbles. I list measurements and amount for toppings, but of course you can adjust to your liking and your tastes. If you have a male in your house groaning about the lack of pizza, feed this to him. My husband loved it! I love the fact that you can pick it up in your hand and hold it like a real slice of pizza. It is a little soft as soon as it comes out of the oven, but it gets firmer the longer it sits. So, what do you need for this amazing pizza? Be sure to sign up with your email address so you can receive all my new recipes delivered right to your inbox! (Look for the sign-up box at the very top of this page.) Also, be sure to follow me on Facebook, Pinterest, Instagram, and Twitter! 1 Recipe Low Carb Stromboli Recipe Click link for recipe. Roll dough between two pieces of parchment paper, until you have a large circle for your crust. Bake pizza crust on parchment paper for 8-10 minutes, or until crust begins to brown. Remove from oven and spread with pizza sauce. Sprinkle with onion powder, garlic salt, and oregano. Remove from oven and cut into 8 slices. If you do not have the Baking Blend called for in the Stromboli Dough recipe, you can substitute almond flour. I like to use Great Value Pizza sauce, as it is relatively low carb and sugar free. When making the pizza recipe and using the Stromboli recipe, do you mix the cheese mixture in with the flour blend. Thank you! Yes, you mix the cheese blend with the baking blend. The detailed instructions should be on the Stromboli page. 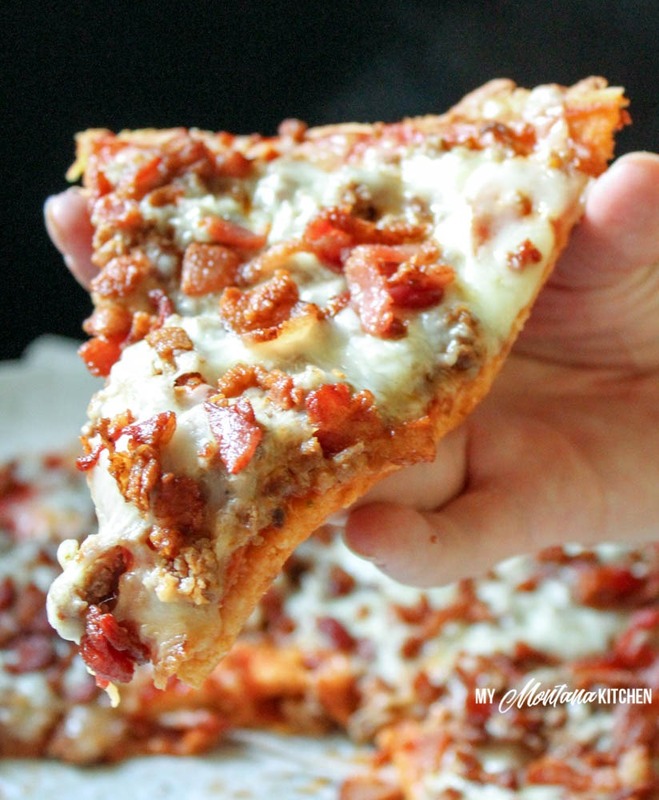 This meat pizza looks so delicious! Yum. The more meat the merrier! And that it’s low carb…..another win! What brand of Italian sausage do you use…… in Alaska I cannot find any without sugar. We actually made our own with a pig we raised and butchered. This sounds so good – we’re always looking for ways to sneak in more pizza without feeling too guilty about it… I think this recipe fits the bill! I was sold at low carb and triple meat. 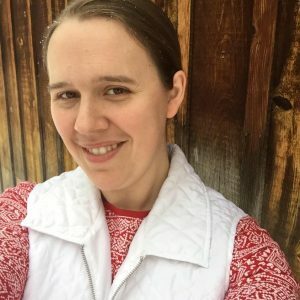 This is a keto girl’s dream– totally adding this to my to-do list! This looks like those amazing-tasting frankenfoods: Totino’s Pizzas with fake cheese and a zillion ingredients. I have been craving pizza for weeks. So many on this plan crave sweets. Not me. I crave savory and salty. I could eat a whole Chicago pizza or a bag of barbeque potato chips…Yum. Let me just say that when we had this for dinner tonight it was a hit with both those on and off the THM plan. Delish. The only change I made was to add thinly sliced mushrooms. I will be adding it to our frequent rotation. I will also add it when I have the cravings that make me stray from the plan. Thanks for your creativity!